Microsoft’s Windows Phone Store has been receiving some love recently. Major developers and brands have devoted some energy to this OS and launched several key apps, such as Pinterest, Tim Hortons TimmyMe, Kobo, and Fitbit even recently announced its commitment to WP8 devices. 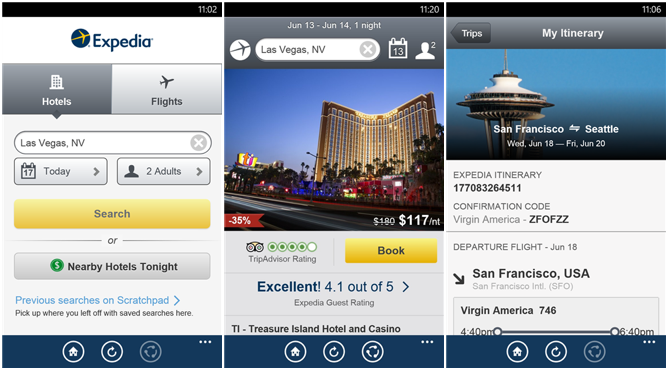 Expedia is the latest company to expand past iOS and Android. The Expedia for Windows Phone 8 is now available to download — compatible with Windows Phone 8 and Windows Phone 8.1 devices — and allows you to book flights, hotels and review your travel itinerary. In addition, something missing from Android and iOS, but on Windows Phone 8, is Expedia Traveler Preference (ETP) and gives the option to pay now or pay later. Expedia also notes that they considering bringing push notifications for trip info to the app.